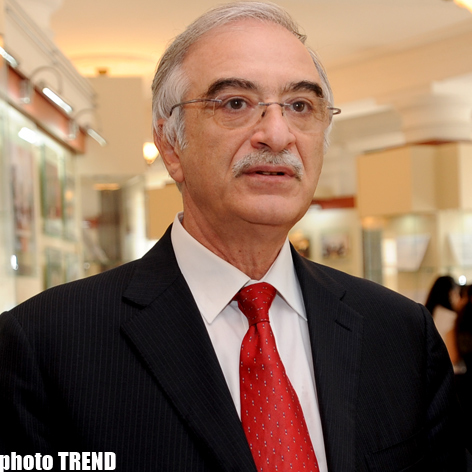 Azerbaijani Ambassador to Russia Polad Bulbuloglu met with students of Moscow State University (MSU). The organizer of the meeting was History Faculty of Moscow State University. Vice-rector of Moscow State University Nikolay Semin who noted the importance of such meetings for deepening the relations between the countries, opened the event. In his speech, vice-dean of the History faculty Alexei Vlasov emphasized the fact that MSU is one of the connecting elements of the cooperation between Azerbaijan and Russia. Opening and productive work of Moscow State University's branch in Baku confirms this. According to him, foundation for sustainable fruitful cooperation for many years has been laid by Russian and Azerbaijani Presidents' efforts. "I am very pleased to speak to you, because just you will determine the relations between our countries in the nearest future. Historians should know well the details of our rich common heritage, Bulbuloglu said. He stressed that the meeting at MSU is held on the eve of the twentieth anniversary of the tragic events in Azerbaijan, which took place in 1990. "Bloody January" left a deep sign in minds of Azerbaijani people. "Twenty years have passed, but the pain of the tragedy doesn't abate. It will be interesting for you, as young historians, to know that, despite all the evidence and barbarism, no one has been punished! No one answered for almost one hundred and fifty victims," Bulbuloglu said. At the same time he stressed that nobody identifies modern Russia with the USSR in Azerbaijan. Today, Russia is a different country. We should together learn lessons from past events. A lesson was that one must not send regular army against its own people under any circumstances. It leads to the collapse of the state. We should establish relations for such tragedies not to occur again," Bulbuloglu added. As to the current state of the relations between Russia and Azerbaijan, the ambassador spoke about the upcoming forum "Russia and Azerbaijan: the horizons of cooperation" in Baku. About 140 people from Moscow, who represent different organizations, will attend the forum. They are leaders of federal power agencies, politicians, scholars, political analysts and journalists. According to him, the forum aims to continue that positive dynamics of relations, which was formed after Year of Russia in Azerbaijan. Then a Year of Azerbaijan was held in Russia. "We considered it is necessary to give new impetus to communication and contact of public figures of both countries. We think that the forum should become an annual event. It will be held in turn. After Baku, the sides can meet in Moscow next year," ambassador said. Alexei Vlasov suggested creating of a common history textbook of the Azerbaijani-Russian relations. Azerbaijani and Russian historians would take part in its preparation. Polad Bulbuloglu also supported the idea. He said during his diplomatic service he has faced with various interpretations of the same historical events of general history, and even appealed to the Foreign Ministry to get answer to the questions raised in Russia's press. Russia must make active efforts to develop and support the Russian language in the countries where it is used, Bulbuloglu said. "Without such actions, the natural process of reducing the use of the Russian language will become irreversible. We must study the experience of France with its Association of French-speaking countries, the United Kingdom with the British Council. They invests millions in establishment the centres for study the languages. They give grants for trainings," Bulbuloglu said, while speaking to MSU students.